Today was our first day to attend our local Episcopal church as a family of three. Bryson and I have been individually a few times over the past year, but never as a family. We have so missed our time at our church. So today was our first day back in church. I had taken Lydia to our church building when others weren’t there several times to familiarize her with the space. We sat in the back and took hoards of animal cookies, her Nemo toy, and Wonder Markers. 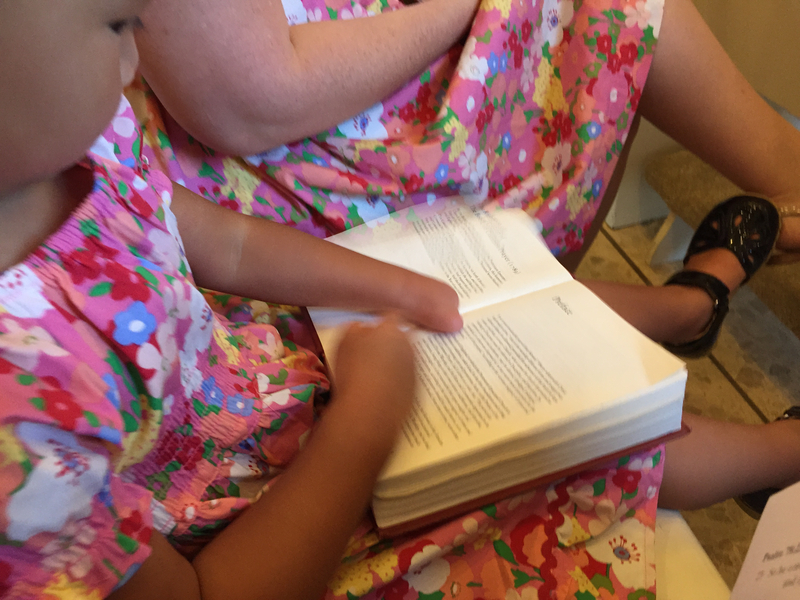 She was more interested in thumbing through the Book of Common Prayer. Lydia loves to talk and might be the most talkative person I’ve ever met. We explained she had to whisper during the service, which would be an amazing exercise of self control. Ha! She is also extremely observant and takes everything in. There were lots of funny Lydia moments. When we were running out to our van to go to church, Lydia declared, “Guys! Guys! Guys! I forgot some-tin’!” Lydia dresses herself, and forgot to wear important undergarments under her clothes. Getting her to wear clothing is always a struggle, but this was remedied before we went to church. It’s a good thing Grace invites people to come as they are. When she heard the choir singing, she yelled, “THEY MAKE MUSIC HERE!” She was very excited about that. When she heard our priest say “angels” she yelled out “ANGELS!” She loves angels. And, I kinda love it that she loves angels so much because so did my Grandma Lydia. With an inquisitive look on her face, she said, “Church is kinda different.” This was after a lot of kneeling, standing, sitting…and repeat. During communion, we went ahead and let her take a communion wafer. She has a thing with textures, and gagged it back out of her mouth and into my hand and declared “yucky!” Then, when she went to dip her wafer in the wine, she decided to just stick her entire hand in the wine without the wafer. Sorry! But the good news is we had just washed her hands. Lydia loved all of the variation – the standing, sitting, and kneeling to pray. She liked that people in the congregation said prayers and would do her best to repeat what she heard with a five second delay. 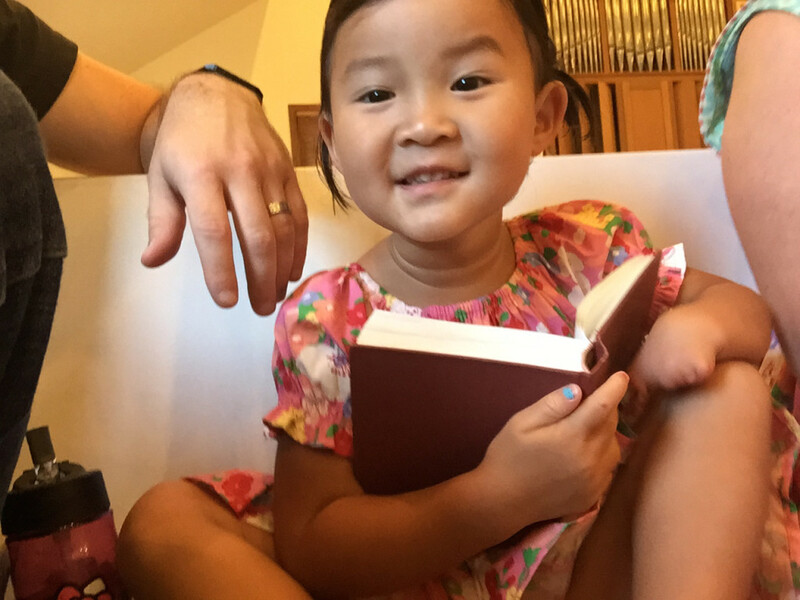 After the passing of the peace, a blessing was prayed over Miss Lydia Grace QiQi. At the end of the service, she asked, “Mommy, are ALL of these people your friends?” I told her “Yes” and explained that they were safe people. We are grateful for our friends at Grace and the way our church has welcomed our family. I am grateful for Miss Lydia Grace and her inquisitiveness – even to the point of putting her sensory seeking hand in the wine. I am grateful for the blessing that she is to us and to others. I imagine that in each funny moment or reminder to “shhhhhhhhhh” and in the wine mishap, our Father was so delighted to welcome her into His house, and His family – even more than we were delighted to be there.